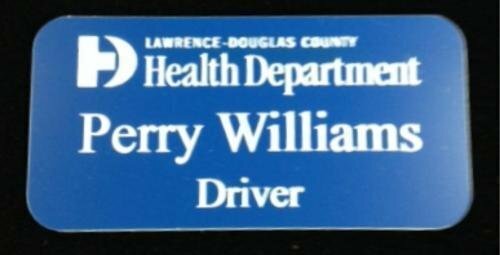 Laser engraved two-color plastic name badge. When choosing the material for your name tag, keep in mind that the engraved text and logo will be the same color. Available in 3 sizes and many different colors. Add a logo to really make your name badge pop. A pin back and up to 3 lines of text are included in the base cost. Laser engravable gold aluminum name badge with rounded corners.